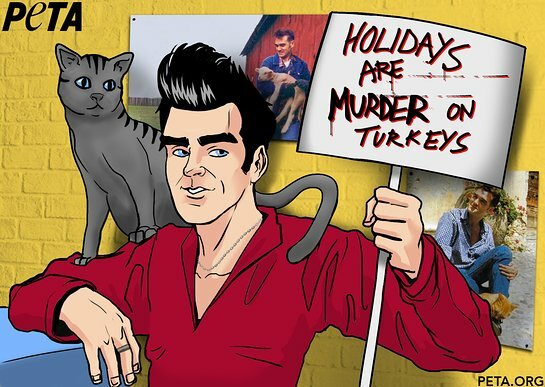 The flier’s specially crafted artwork features photos of Morrissey with animals behind a cartoon image of the veg icon holding aloft a sign bearing the campaign slogan. He has recruited PETA members to hand the fliers to thousands of fans exiting each of his 17 U.S. shows, including performances at the Hollywood Bowl and Madison Square Garden. “We hope this unique artwork will end up on refrigerators across the country as a reminder that animals shouldn’t be sacrificed for holiday feasts,” says PETA Vice President Dan Mathews.